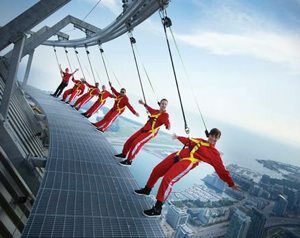 EdgeWalk at the CN Tower, has become Toronto’s most extreme attraction. Thrill lovers will walk on the edge of one of the world’s tallest buildings — 116 stories high above the ground. Visitors will walk with a guide, in groups of six, while attached to an overhead safety rail via a trolley and harness system.